Ãƒ² No ghosting and no degradation Ãƒ» Guaranteed. Ghosts, shadows, or streaks in picture adjacent to vertical edges may be a cause of faulty cables/termination. VPI cables are manufactured with the highest standards and provide a solid image with no ghosting & no degradation Ãƒ» guaranteed. 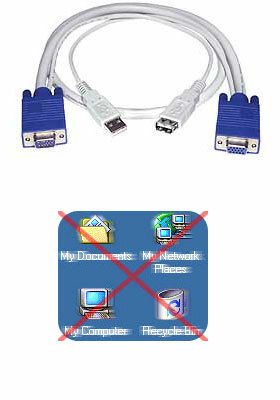 Ãƒ² VGA + USB all-in-1 KVM cable. Ãƒ² Makes connections and set-ups neat and easy. Ãƒ² Triple shielded for noise reduction. Ãƒ² Use to extends a VGA monitor and USB device.